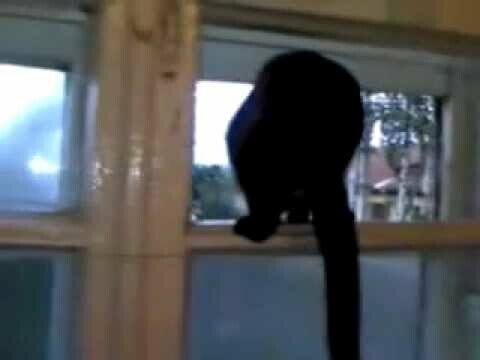 This barking cat has garnered the attention of the world! What’s going on here-since you can’t see the cat’s face at first, is it a “bark-over?” No, when you look again and again ( I won’t tell you how many of the 6,615,857 views are mine), you actually see the cat’s body heave in rhythm with the ‘bark.’ Or does he see an intruder out the window and is protecting his home? Mmmmm, probably not- since cats are both predator and prey, if there were something or someone that scary invading his territory, it would be normal for that cat to jump down from the open window and run and hide. So what’s up with this guy’s woof-woof? This poor kitty is actually coughing-and that’s not normal! Some might say he’s having a bad hairball day, and that’s what’s causing the bark/hack. Hairballs are NOT normal, and while urban legend and suppliers of hairball remedies and foods might suggest that, any good feline veterinarian will explain differently. He’s hacking, and probably because of either a lung or intestinal problem. Perhaps he has feline asthma or feline heartworm disease (which is really lung disease). Regardless, this coughing cat needs to visit its veterinarian NOW. Before he goes into a crisis. His doctor will perform a thorough examination including looking in his mouth and throat, listening closely to his lung and heart sounds, feeling his intestines and other abdominal organs; even some x-rays may be in order. Once the reason for this awful, agonizing cough is identified and a treatment plan which both the cat and its owner can accomplish, then everyone will feel better- most importantly the coughing cat! A call came in yesterday from Oreo’s people telling us that Oreo was drooling like crazy, ropes and ropes of copious drool. Oreo’s a fine, strapping 2 year old kitty with a healthy curiosity. I started thinking about all those things that Dr. Ray talked about like bad teeth or something stuck in the mouth. Nausea also can make cats drool, though usually not in such excessive amounts and the kitties with nausea act like they don’t feel good. Oreo came in and sat on the exam table pretty much nonplussed. As a matter of fact he didn’t act bothered at all, except for the occasional fling of the head when his ropes of saliva drooped from his mouth. Yuk. He’s such a sweet boy and he let me get a really good oral exam. He had beautiful teeth and gums. Everything in his mouth, under his tongue, up on his palate and down his throat looked perfectly normal. What the heck was going on? I see one or two of these cases just about every year. It seems to last several hours to, rarely, several days. They tend to come in during warm weather and while I don’t have an exact answer, I’ve got a suspicion as to why it happens. Cats are notorious for drooling when they taste something bad. We see it sometimes with certain antibiotics and other things they might try to lick. Since I never have been able to find a problem in the mouth of one of these cats, it makes me wonder if there’s an unpleasant taste at work here, like a bug or something that they chomped on. But that never explained why the drooling seemed to last for so long. Then I heard a science related radio program that discussed how some people get a bad taste in their mouth after eating certain things. I think they were talking about certain varieties of pine nuts. The bad taste sometimes lasted for days and the theory was that there was some errant molecule sitting on a susceptible person’s taste bud receptor that made it keep sending the bad taste signal. It kept sending that yucky taste signal until the molecule finally floated off the receptor allowing it to return to normal. Now I don’t know if this is the answer to the mystery drool, but I wonder if there’s a subset of cats that eat just the right ant or other bug and gets a similar phenomenon. And then, being a cat, start to drool. Luckily, all my cases have resolved. Most are better in just a few hours but occasionally I’ll see one that last’s a day or so. I always treat with something to help the drool and make them more comfortable so I doubt that I’ll get a chance to test my theory. Always take your cat in to be checked if you see anything unusual like this. The first thing you have to be concerned about is that there’s something wrong with the mouth. But you may also find that your cat’s a candidate for “Mystery Cat Diagnosis”. Hmmm, maybe we should try to pitch that to cable TV.